No Police State at Hunter College! Hunter students march to citywide protest against attacks on education, 4 March 2010. MARCH 9 – Last Thursday, March 4, hundreds of Hunter students walked out to protest tuition hikes and budget cuts that are part of a nationwide assault on public education being pushed from the White House, the governor’s office and City Hall. Adjuncts, who face the threat of layoffs, and other faculty joined the protest too. Repeatedly, the crowd picked up the chant “Students and labor, shut the city down,” which we launched in the previous round of struggles to defend the right to education. Many would later head downtown to join citywide protests in front of Governor Pateron’s office and the MTA hearings. “Whose school? Our school!” was one of the most popular chants. We are exercising our most basic rights when we protest hikes and cuts that amount to a “race and class purge” of CUNY. 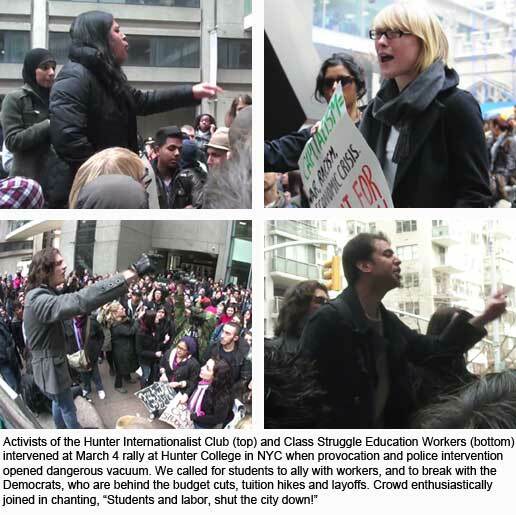 But the Hunter administration turned Hunter College into “Lockdown U.” For them, it was one big opportunity for a show of force; as a speaker from Class Struggle Education Workers (CSEW) told the rally, Hunter looked like a “correctional facility” last Thursday. Jails, not schools – that is what the bankers, real-estate speculators and other capitalists who control the city (and CUNY’s Board of Trustees) have in mind for working-class, black, Latino and immigrant youth. Last fall, campus cops told cafeteria workers they were “not Hunter employees” as they tried to block them from protesting the administration bringing in a company that tried to slash their health coverage. The response to March 4 should be to demand: Cops off campus! No turnstiles! The administration and Board of Trustees should be abolished and replaced by representatives democratically elected by students, faculty and campus workers. Police charge into rally at Hunter College, March 4. A pretext for direct police intervention in the March 4 rally was provided by the actions of a small group of supposed “anarchists,” who assaulted and threatened activists involved with organizing the protest, including Childhood Learning Center defense activist Luz Schreiber, as well as the vice president of the Internationalist Club when she stepped in to defend Luz; a leader of the faculty union; and a spokesman for the International Socialist Organization, which also had its club office viciously defaced. Since this incident, a furious exchange of e-mails and Facebook postings has opened up in which the “anarchist” supporters outrageously try to cover up the vile attack on Hunter activists, while some others go after “off-campus students” and pose the issue as one of “the Hunter community” against interlopers from other schools. Both the use of violence against demonstrators and railing against “outsiders” aid the administration’s attempts to seal off and clamp down on protest at Hunter. The fact is that the assault on public education which CUNY students are facing is citywide and nationwide in scope. The situation at Hunter and CUNY is tied in with the racist closing of 19 more NYC schools, and the “educational colonialism” that implants charter schools in Harlem and makes PS 198 on 96th Street a shameful example of “separate and unequal” segregation, as exposed by the Village Voice (Feb. 23). It goes together with the images flashed on NY1 of a young black student being manhandled by a burly MTA guard as she was testifying against the plan to take away students’ Metrocards, and the looming layoff of a thousand subway and bus workers while service cuts target one community after another. To defeat these attacks, we must ally with and help mobilize the power that actually can shut the city down, as shown by the 2005 transit workers’ strike: the power of the multiracial working class. But to do this, as Internationalist Club and CSEW speakers stressed, it is necessary to face the political issues in this struggle – first and foremost, the need for a throrough-going break with the Democratic Party, which from President Obama down to Governor Paterson is openly driving the current assault on public education. So what actually happened at the rally in front of Governor Paterson’s office on March 4? While students from schools around the city were in a fighting mood, the rally there was a routine affair, with union and student bureaucrats making ho-hum speeches about “unity” while Democratic councilman Barron became the star of the show. He put out some militant-sounding phrases and then proceeded to openly support Paterson, claiming the budget-ax governor would work with students to reverse the cuts, and asking Paterson (and Obama) to please “represent us.” Thus, exactly as we had warned, reformist organizers made a platform for class-collaboration with the very party that is leading the attack on workers, students, and the peoples of Iraq and Afghanistan today. The bottom line is: you really can’t fight to defend public education, to restore open admissions and no tuition, you can’t effectively oppose police repression, racism and war – unless you fight their cause: capitalism. This is true from NYC to Oaxaca, Mexico; from Puerto Rico to Paris to Port-au-Prince. That’s why in the mobilizations against the tuition increase and budget cuts a year ago, we appealed to and got the support of workers and unions from around the region, as we also did in the 2001 struggle against CUNY’s “war purge” of undocumented students out of which the CUNY Internationalist Clubs grew. This is a class struggle. 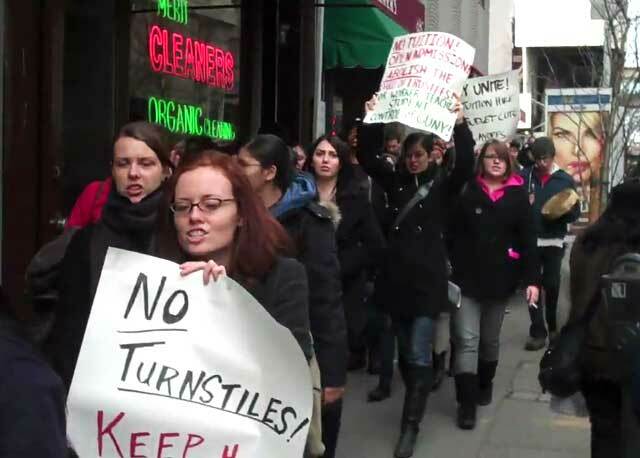 See also: Students and Labor: Shut NYC Down, Stop the Assault on Public Education! See CUNY Internationalist Clubs video of March 2009 protests: "Fight the Tuition Purge at CUNY: Students and Labor, Shut the City Down!"